Boosts cooling for Mac Pros installed on ProBracket rackmount systems. 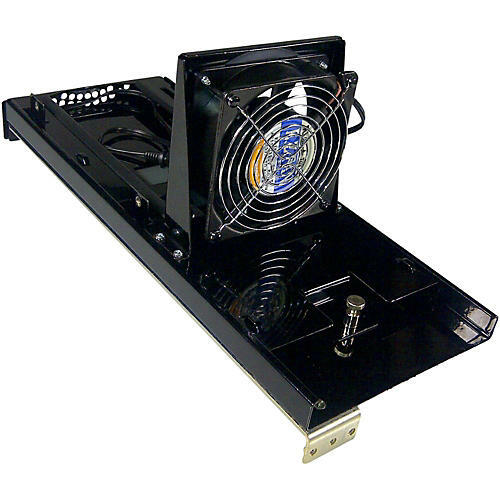 The JMR MPRO-COOL is an add-on accessory for the MPRO-SNGL-RM rackmount ProBracket and provides boost cooling for your installed MacPRO in those situations where the computer runs too warm due to surrounding equipment or air flow restrictions. Featuring a 120mm x 38mm, 2000 rpm, 52 cfm cooling fan (120V, 50/60 Hz) preinstalled on a custom mounting bracket which in turn installs on the MPRO-SNGL-RM with just four supplied machine screws, the MPRO-COOL has rubber gasketed surfaces which engage directly with the “top” (exhaust) side of the MacPRO to greatly enhance airflow in restricted areas. The kit has a preinstalled finger guard and six foot 120V power cord, and can be added to a new MPRO-SNGL-RM in just a minute. The MPRO-COOL is a whisper-quiet 30db(A) and when used with the MacPRO, cannot be heard. Complete with screws for installation and instructions.